The constantly-missed family events and delayed holiday celebrations can get tiring and create isolation that can turn emotions into anger and resentment, pushing a couple further apart. Couples that fail to communicate drift apart and often seek an emotional connection elsewhere that can lead to infidelity and ultimately a divorce. 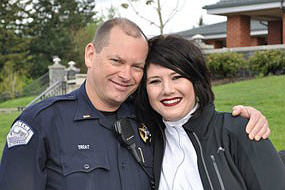 LEOs have a tendency to protect their spouses from the reality of the job by not communicating about stress on the job, dangerous situations or stressful department politics. This can have the opposite effect on spouses as it seems secretive, and they can shut down emotionally from feeling abandoned by LEOs' not communicating openly. 6. Do not allow "partner envy" or a feeling of competition for your time to enter your home.